At CAM Metal Products, we utilise the latest sheet metal technology to provide quality components and products when you need them. Working with clients across Australia, our leading sheet metal fabricators provide fast results at economical prices. Contact us today for local services with a national scope. The process of metal bending is straight forward but the task at hand should not be under estimated or labled as simple. Quality sheet metal bending has the ability to produce tight radius bends with absolutely no wrinkes or deformation. Whether we need to produce a V-shape, U-shape or perhaps a channel shape along a straight axis our manufacturing facility in South West Sydney can achieve this for you. Our metal bending capability includes Air Bending / Pressing and CNC Sheet Metal Folding. From stainless steel, galvanised steel, zinc, alloy, copper, aluminium and structural steel our team at Cam Metals take pride in the high quality workmanship and customer service that follows. Cammetal's advanced CNC sheet metal folding and bending machinery is not only designed for high tech precision but will offers increased productivity ensuring we can deliver any size project in a timely and efficient process. Our team are proficient in it's use and their craft meaning you can expect outstanding quality. CAM Metal Products was established in 2004 to take over contracts for the Bosco Group of Companies when that business was sold. 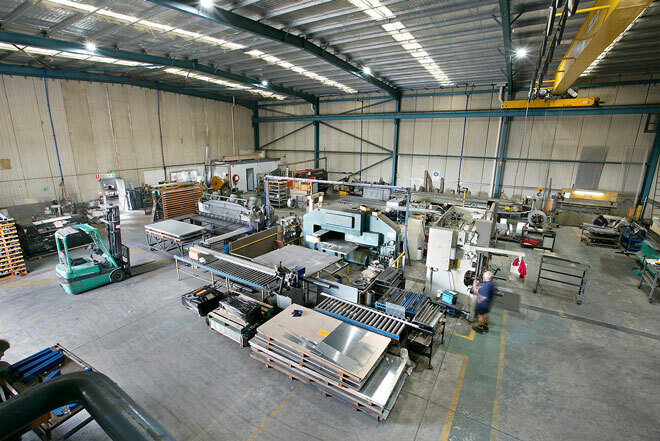 We combine the experience of a large team with the personal touch of local sheet metal fabricators to deliver expertly crafted results across Australia. Today, CAM Metal Products manufactures and markets architectural sheet metal, ceiling grids and metal ceiling tiles, tank stands, electrical boxes, office fit-out components and many other metal fabrication solutions for our clients. Colin Appleby – Business development, marketing and office manager with 30 years of experience in the transport and installation industries. Alan Chaperlin, B.Sc. (Metallurgy) Wollongong – 25 years of experience in furniture and systems design and manufacturing. Previously employed as production manager with Carmen Furniture, RJ Design and Bosco Group of Companies.